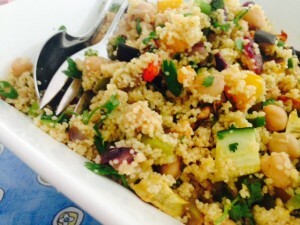 If you would like a break from salads based on potato, rice or pasta then this cous cous and chickpea salad is a great choice, packed full with flavour. In a large bowl combine the cous cous and the boiling water and leave for 5-10minutes to enable the cous cous to swell. Add all the remaining ingredients (except for the dressing) stir to combine and then set aside. The flavour improves with standing so this salad can be made the day before if necessary. Prior to service combine the dressing ingredients together and pour over the salad. Stir well. * The choice of oil is up to you but Avocado oil that has been spiked with lime; or Olive oil spiked with orange are particularly good. You could also use sesame oil if you prefer a more oriental flavour. ** Recommended vegetables could include 100g each of sweet potato (Kumara), pumpkin, red onion, green and red capsicum, courgettes, egg-plant.